Dell has announced Presto , a new customer service initiative, this morning at its Innovation Event in Marbella, Spain. 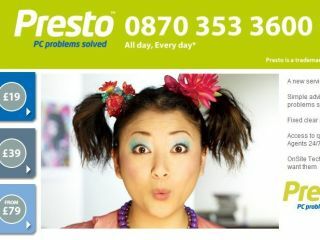 Presto is designed to offer a "comprehensive, convenient and easy-to-use support service" around the clock. In his CES keynote earlier in the month, Michael Dell had announced that Dell would be seeking to improve the support services it offers customers. Presto offers two options for help - OnCall and OnSite. But it isn't cheap. There are various price structures for the service, starting at £19 for one-time OnCall support over the phone. The annual subscription is £99. OnSite support starts at £79, though there is no annual subscription for this. Instead, there are more expensive charges for more complex issues such as reinstalling your operating system. "Presto supports the total PC environment," says Dave Moore, the director of Presto. "So it doesn't matter what brand of printer or wireless router or other device is the issue, we'll solve the problem for the customer," Moore added. The service aims to help out any Dell customer seeking support on any computer-related issue, whether it's setting up a wireless network, tweaking a setting in the Control Panel or installing a game. The service launches today, initially in the UK, France and Germany. In the UK the OnCall service has a national rate phone number - 0870 353 3600.